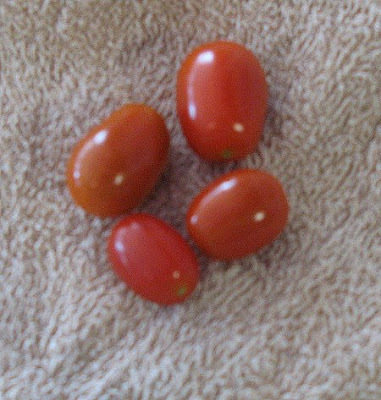 The Un-Official Blog of Romance Author Maddie James: Baby Tomatoes! Really and truly, however, they are not as huge as they appear in the picture. Actually, these are tiny little grape tomatoes and yes! they came from my tiny little backyard suburban garden (if you want to go so far as to call it a garden). Last year my tomatoes were in pots; this year they went into the ground and whoa! Boy, did those tomato plants grow! I have one grape tomato plant that is huge, with lots of small tomatoes on it already and a whole lot of blooms. There are two other regular tomato plants as well, and some tomatoes and blooms sitting on them, as well. I think the grape tomatoes will be the bumper crop this year, however. So, I had to do something with these little babies, right? 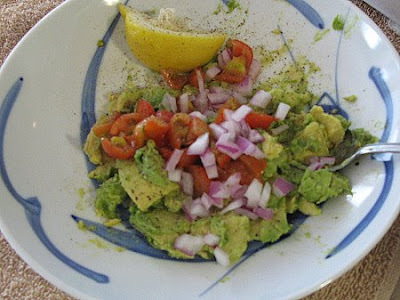 I knew I had an avocado that I needed to eat this evening so...guacamole! 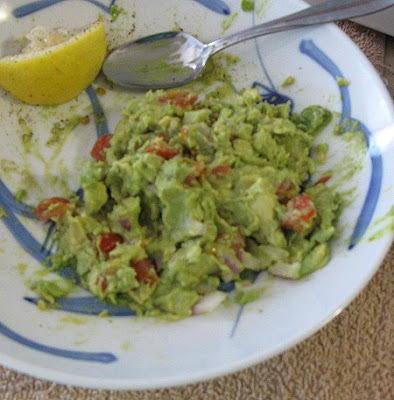 Mash it all together and you have homemade guacamole! Just add tortilla chips and munch away.